Some of the top predators on the planet live at the Great Cats exhibit—African lions, Sumatran tigers, bobcats, and caracals. At each enclosure, visitors can learn about the cats’ characteristics, including social structure, hunting, reproduction, and the Zoo’s efforts to care for and conserve these species. Three outdoor habitats are home to the Zoo’s lions and tigers. Visitors may catch a glimpse of the cats patrolling the edge of the moat. 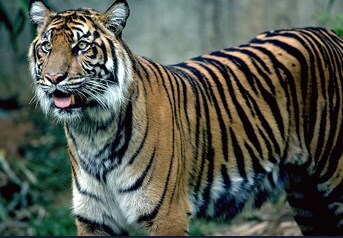 On hot days, the cats—and Sumatran tigers, in particular—may choose to take a swim! The bobcat and caracal enclosures are located adjacent to the lion and tiger exhibits. Like their larger neighbors, these cats’ homes are decked out with lots of trees for climbing, branches for balancing, low plants for hiding, and a shelter for relief from the elements.